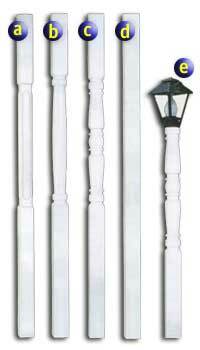 Experience the ease of maintenance-free vinyl porch and lamp posts! Four great styles to choose from! Available in 4" and 5"
Mounts post sleeves to concrete and deck installations; provides a great alternative to wood and conquers the warping, bowing, cracking, splitting and rotting issues. Our standard model (shown left), was designed for level surface installations and features touch poly resin blocks with our "slide and lock top" that offers adjustability for variable height rail installations. ALso available is our adjustable leveling model (show right) that provides up to 5 degrees of correction and assures plum installation when mounting on non-level surfaces. Both Structural Posts feature easy installation, designs that support 36" and 42" rail heights and a stainless steel mounting base that promotes confidence that the job is done right and built to last. For protection from the elements, complementing your deck and railing to hiding old discolored and splintered wood posts. Available in 4" & 6" widths in 96" & 108" lengths in white and tan.